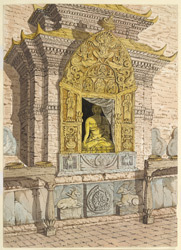 Watercolour of the shrine of the 3rd Celestial Buddha, Ratnasambhava, at Swayambhunath in Nepal, by Henry Ambrose Oldfield (1822-1871), dated April 1854. This image is inscribed on the reverse: 'Shrine of the 3rd Celestial Buddha, Ratnasambhava, on the south side of the temple of Adi Buddha, Sambhunath. April 1854', together with notes. Dr Oldfield, who was Residency Surgeon at Kathmandu from 1850-1863, wrote in Volume II of his 'Sketches from Nipal, Historical and Descriptive...' (1880), "Round the base of the hemisphere or mound of the temple and built partly into its plinth, opposite the four cardinal points, are five large shrines, covered with copper-gilt, and each of which contains a gilt image, rather larger than life size, of one of the divine Buddhas...Above each shrine is a gilt toran...on which is represented in relief a figure of Garura standing upon a pair of nagkunyas, or mermaids, each of which is supported upon the coils of the tail of a grotesque sea-dragon."